The 4pc Outdoor Adventure baby bedding collection by Sweet Jojo Designs will create a designer nursery with a modern flair. This fun and charming crib bedding set uses a colorful collection of exclusive 100% Cotton fabrics. 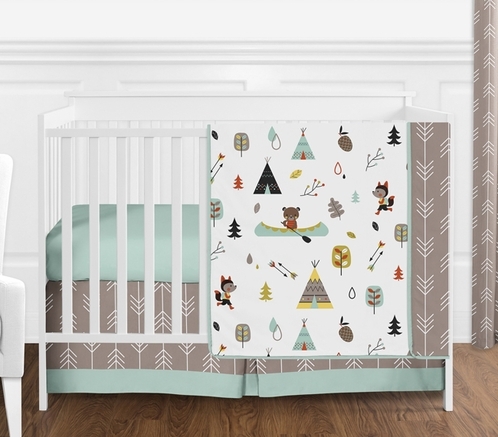 It boasts an outdoor themed print featuring foxes, bears, teepees and trees. It also includes a coordinating arrow print and solid aqua cotton. The pleasing color palette of stone, aqua, orange, yellow and chocolate will set your nursery up in high style. This Sweet Jojo Designs set will fit all standard cribs and toddler beds and is machine washable for easy care and repeated use. The blanket is designed using the colorful outdoor print. It reverses to the coordinating arrow print and finished with aqua piping. The aqua coordinating crib sheet is 100% cotton for ease, comfort, and repeated use. The pleated skirt uses the arrow print and it is finished with an aqua border.